Since the 1960s, Japan has been a historical leading study abroad destination for US undergraduate students. This book explores the long-term impacts of study abroad through a lens of knowledge diplomacy and the cultivation of individuals with understanding of the host country and world through transformative international experiences. 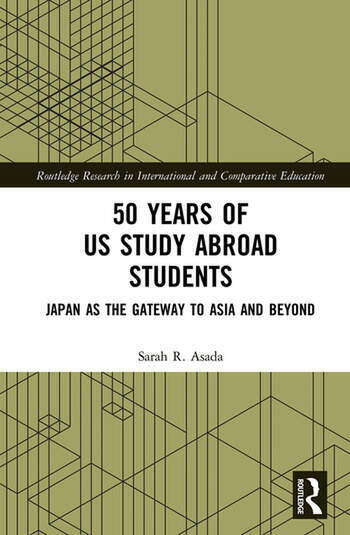 Based on extensive original survey data and interviews with alumni over nearly 50 years of the Japan Study Program, the book provides a historical perspective on the personal impacts of study abroad on academic, professional, and personal development. The author further explores knowledge diplomacy seen as the creation of an in-depth understanding of the host country, familiarity of the host region, and awakened consciousness of the world through subsequent life experiences. Sarah R. Asada is an Assistant Professor of Comparative and International Education in the Faculty of International Studies at Kyoritsu Women’s University (Tokyo, Japan). She received her Ph.D. in International Studies and M.A. in International Relations from Waseda University (Tokyo, Japan) and a B.A. in Language, Literature, and Culture with a focus on Japan from Antioch College (Ohio, US). Her research interests encompasses comparative international higher education, the sociocultural context of education, international relations, and transnational mobility of students and scholars. She has conducted research in Japan, the US, and Southeast Asia. In addition, she has over a decade of professional experience in study abroad program administration and management.